In India we find, as in most countries, that Talismans very frequently have religious origins, and representations of the Deities are in common use for the protection of their wearers, as well as for their spiritual and material well-being. A belief in a Trinity of gods is universal, with Brahma as the Creator, Vishnu the Preserver and Restorer, and Siva the Destroyer or Regenerator. In the course of the developments of the various sects Vishnu, originally regarded as a manifestation of Solar energy, became the supreme god, and the worshippers of Vishnu attribute to him all the qualities of the triune gods, his image and various symbols being amongst the most common of Indian Talismans. He is believed to have ten Avataras, or Incarnations, in which his spirit descended in human form to effect great reformations and to regenerate the world; the tenth incarnation, yet to come, is for the final destruction of the wicked, and to regenerate and purify the world. Gotama Buddha, the founder of Buddhism, was Vishnu's ninth incarnation, and his images and symbols are extremely popular Talismans for protection and good fortune. Buddhism, which was founded about the fifth century B.C., has established itself throughout India, China, Ceylon, Japan, Thibet, and Central Asia, inculcating a very high system of theology, the ultimate end of which is Union with the Divine. The Brahmins place Buddha foremost amongst the gods, as opposed to Brahma of the Hindus. Amongst other sects, Siva is regarded as the greatest of the gods, and there is much overlapping amongst these beliefs, and numerous minor gods exist, typifying various virtues and gifted with powers and attributes which bring them into intimate relations with humanity, for which reason their symbols and personifications are in common use as Talismans. 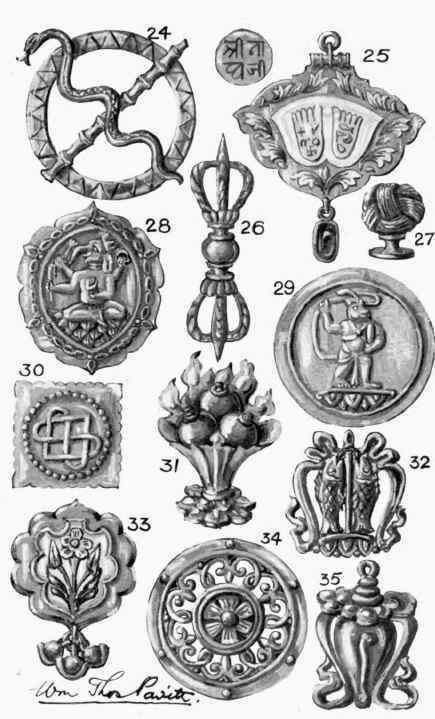 Talismans of Ganesa, the elephant-headed god, the son of Siva, (who is regarded as the God of Wisdom and Prudence, and the Remover of obstacles,) are always worn when any important undertaking is begun. He is represented with four arms holding respectively a Lotus, a Shell, a Goad or Club, and the Discus or Wheel, and the rotundity of his body is symbolic of his high importance and good standing, and not, as might be supposed, intended as evidence of good living (see Illustration No. 28, Plate II). Hanuman, The Monkey God, is the most popular form of Talisman for Luck, Health, and Good Fortune amongst the Hindus, and his wonderful exploits are a constant theme of interest from childhood to old age. He was unequalled in learning, knowledge of medicine, and magic, and his skill and cunning in defeating his enemies were superhuman; he fought for Rama, who was an incarnation of Vishnu, performing on his behalf prodigious feats of valour. On one occasion, whilst fighting against Ravana the King of Demons, his enemies greased his enormous tail and set it on fire, but only to their own discomfiture, for with it Hanuman burnt down Lanka, their capital city (see Plate 2, No. 29). The eight glorious emblems of Buddha are all used as Talismans; they consist of the Wheel of the Law, the Conch Shell, the Golden Fish, the Lucky Diagram, the Lotus, the Umbrella, the Vase, and the Trumpet of Victory. Buddha at his birth had the marks of two feet upon his head and a wheel, or disc, in his hand, by which symbols the Pandits foretold that he would become a great ruler. prev: Aum. Om! Ah! Hum!